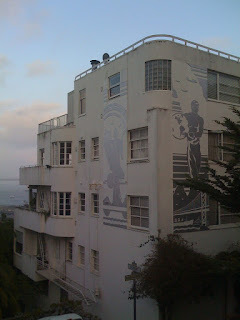 The apartment where Lauren Bacall's character hid Humphrey Bogart in Dark Passage has always been one of my favorites. 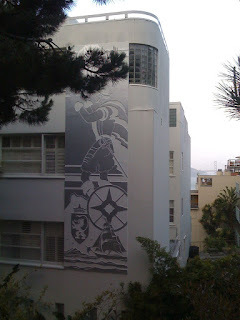 It's a 1938 design by architect Irvine Goldstine, with ornamentation that seems to epitomize the Age of Progress. A bay view apartment came up for sale in this building about a year ago, priced at something like $250,000. Naturally, there was a catch: It was part of some sort of affordable housing program, and you couldn't buy it unless your income was below $50,000 or some such amount. As that wouldn't qualify you for the mortgage, I'm not sure how that was supposed to work.